← Mid-March Resolutions progress report! 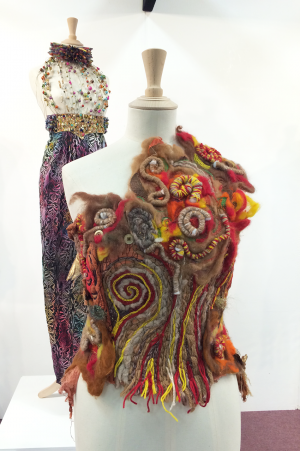 Dedicated to passing on yarn craft skills. 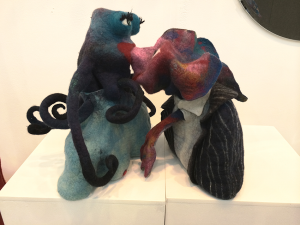 I did eight hours with them, passed on some knitting skillz, learned some new skillz myself, and had a thoroughly pleasant time! This was my station on Saturday at the UKHKA stand. So, what did this involve? 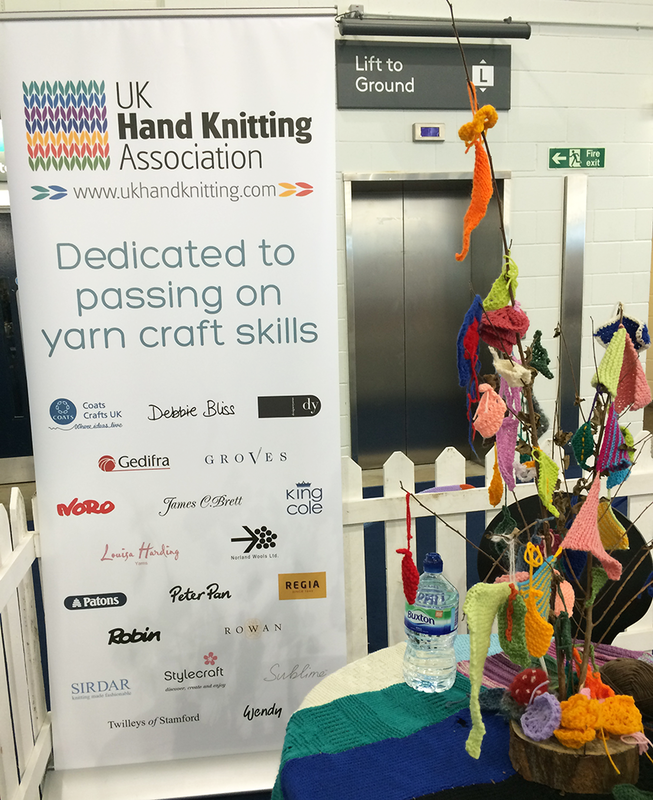 Basically, sitting on the lovely stand in a corner of the exhibition hall, with trees decorated with knitted leaves, teaching passers-by to knit said leaves. The first day, Saturday, I was a bit quiet – there were many people coming on to the stand to learn something new, but about 95% of them were knitters looking to learn how to crochet. Trees decorated with knitted and crochet leaves. 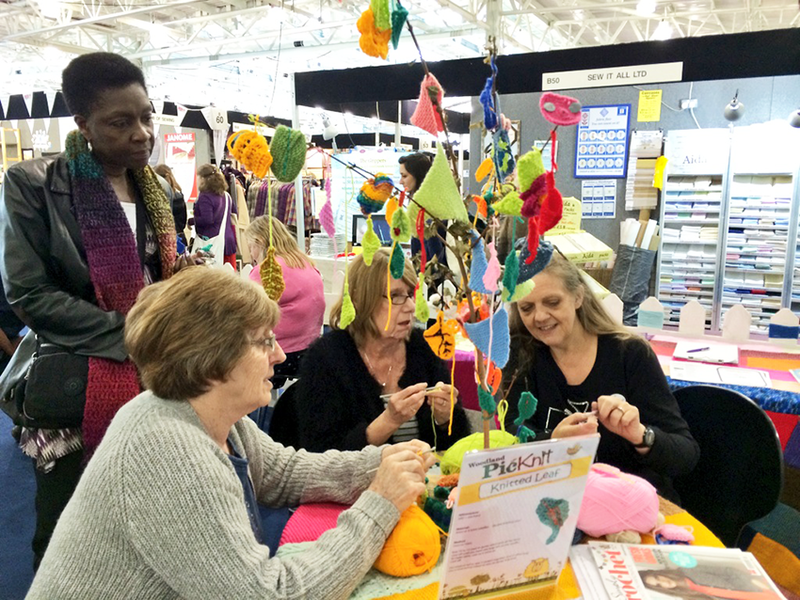 Knitters wanting to learn how to crochet at the UKHKA stand. I worked on Hitchhiker for a while, then decided this was the perfect time for me to join the crowd. I sat down with one of the other volunteers, and by the end of the morning I had made this. 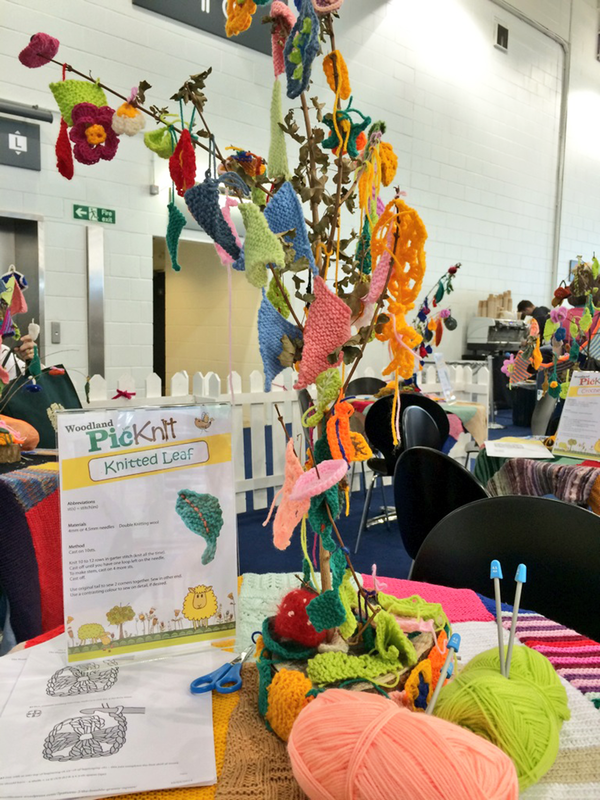 On Sunday, I turned up and the first person I taught was indeed a girl who wanted to learn to knit. This was completed successfully in about an hour, and she took her little leaf off with her a little proudly. I was then approached by a woman wanting to learn to make a granny square. 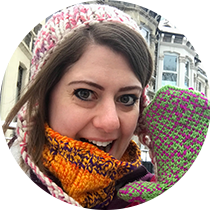 We went through the pattern – she was an experienced crocheter and just wanted to learn the steps, and off she went happy. One of my students leaves. Then the big challenge came. 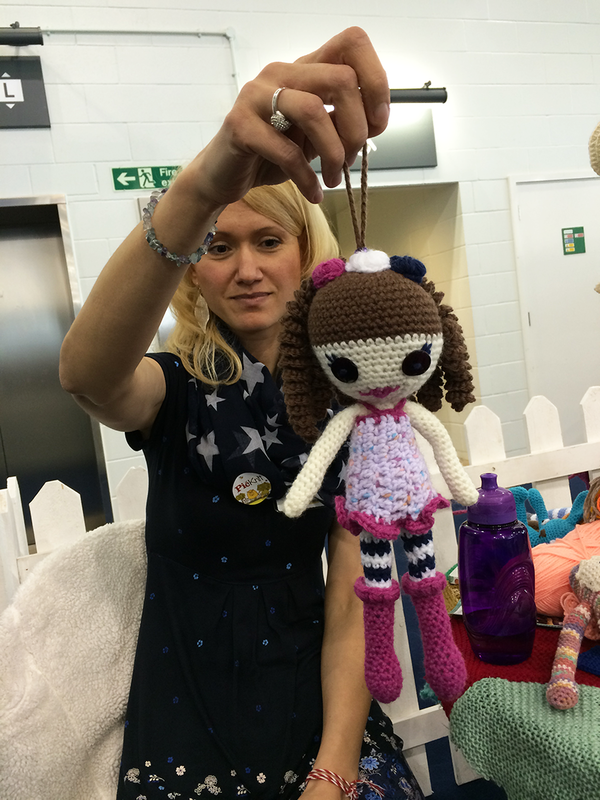 One knitter turned up wanting to learn to crochet from scratch. I explained it was a little like the blind leading the blind, but I was game if she was. She was, and we sat down and got to work. Shortly afterwards, we were joined by the sweetest two women, and I got them started as well. 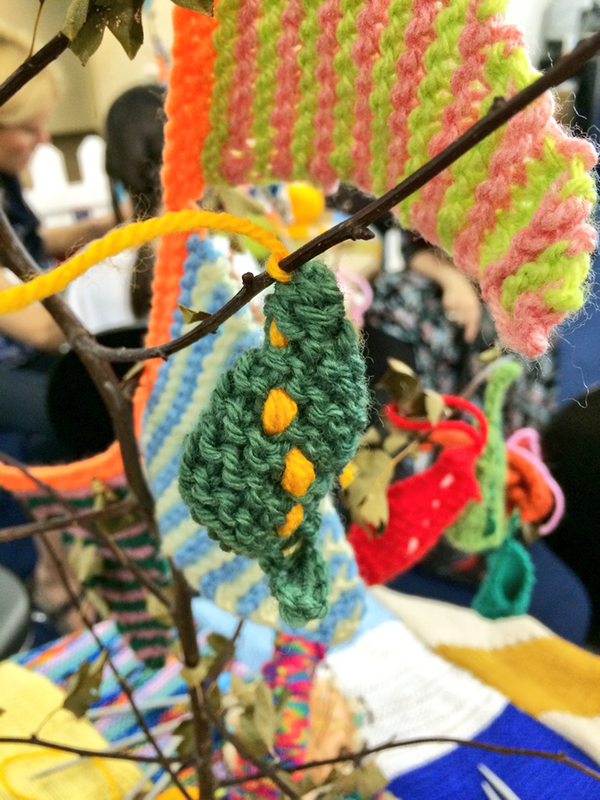 When you look at one of the other volunteers work, you see how incredible crochet can be. Two and a half hours later, we had three slightly clumsy but beautiful granny squares. I have never been so proud of a group of people – them for managing it, and me for not falling to pieces!! I was then sent off to experience the rest of the show. I had fun at this show last year, but it was a little overwhelming, There were *so* many people and stalls, and I just got lost in it all. This year was much, much better. There were a lot more knitting vendors, and the quality of their stalls was much improved. 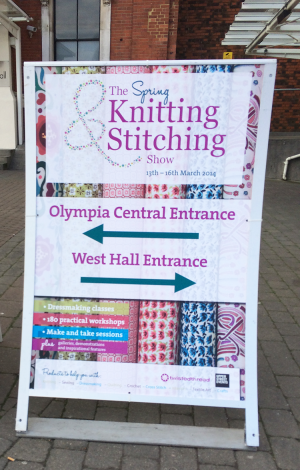 The Spring Knitting and Stitching Show. I think the thing I loved the most was the set-up of stalls. In general, things were a bit more professional, the knitting sections seemed mostly grouped together, rather than interspersed haphazardly among the sewing stalls, and the stand decorations were great. Special kudos to Toft Alpaca for their hanging knits, and crochet amigurumi! 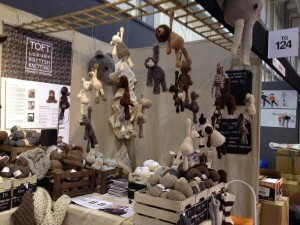 The Toft stall looked a little something* like this! 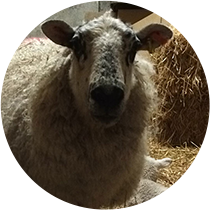 I visited UK Alpaca and bought some yarn for a super-secret project that has to be completed in the next month…if I managed to make the Weasley Sweater in this time, I anticipate I should manage it…but it will definitely be a challenge! I have wanted to start this project for the longest time, but never felt I had found the right yarn, so when I walked away trying not to make an impulse buy, I thought I would really regret it and ran straight back to buy it. I also bought myself some new Chiagoos. Cos they were cheap! Some really gorgeous textiles on display. I wandered around a bit more, but having a lack of money and being desperately hungry for some spaghetti, I made my way out and continued on my merry weekend! It was a wonderful weekend, and I am so pleased to have been included with the UKHKA. They are a fantastic organisation, particularly when it comes to children. If you are looking to start a knitting group, do check out their tips on their website! 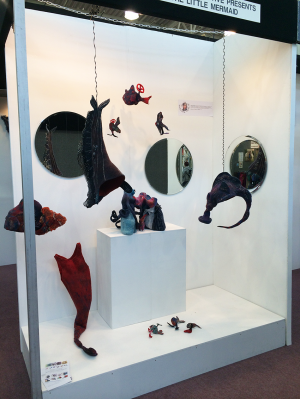 A display of felted items at the Knitting and Stitching Show. Did any of you make it to the show? * This photo is from a previous show! I do not have one for this year, and I took this photo from the Toft Alpaca Twitter Feed. 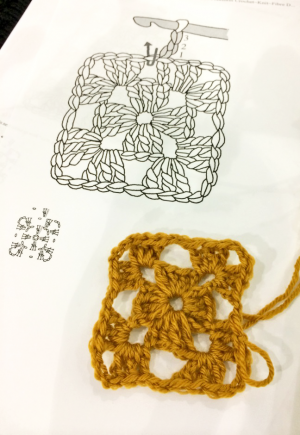 This entry was posted in Knitting, Reviews and tagged Crochet, Granny Square, Hitchhiker, Knitting, Teaching, UK Hand Knitting Association, UKHKA, United Kingdom Hand Knitting Association. Bookmark the permalink. It was! Do you have any shows like this near you?